Home > Unicycle > Unicycle > How to choose your unicycle ? How to choose your unicycle ? What Unicycle size suit me ? Often it depends on the size of the unicyclist. For a small child, a wheel of 16 inches is recommended. 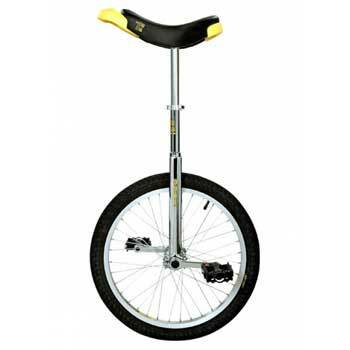 Although the child can do much before growing rapidly, if there is no younger siblings in her lined for use on small unicycle, it may be wise to wait to buy a 20 inch unicycle. For an older child, teenager or adult, we usually recommend a 20-inch wheel. 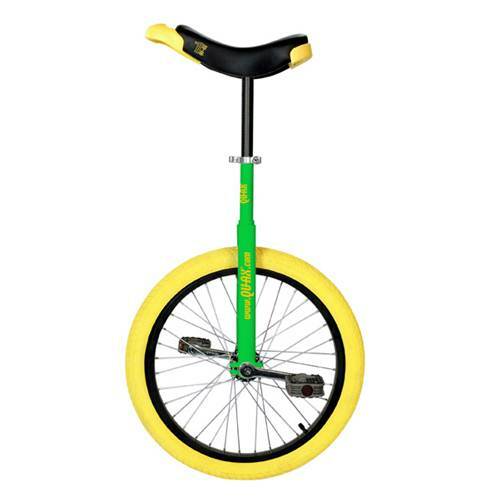 A 20-inch wheel is suitable for indoor and practices is that unicycling Most members use to the figures. If the unicycle will be used primarily for hiking, distance running, off-roading, and outdoor exercise, a 24-inch wheel will be better. 3 to 6 years: unicycle wheel 12 "
6 years: unicycle wheel 16"
8 years: unicycle wheel 18"
10 years: unicycle wheel 20"
15 years and over: unicycle wheel 20", unicycle 24", unicycle 26 ", unicycle 28/29", unicycle 36 "
Again, this can vary depending on the size of the child. What Unicycle category I should choose ? Learner Unicycle: is often a wheel with 20 or 24 ", and is mainly suitable for rolling. To do jumps, or more advanced figures, you will probably buy better hardware advanced. Freestyle/artistic Unicycle: should to stroll down the street and do tricks "type circus." It can be equipped with a square yoke, cranks and smaller according to FIGS. Cross/Muni Unicycle: will be ideal for hiking in the forest, and large rocky path. It will be equipped with a tire cross and pedals with pins. Street/Flat/Trial Unicycle: allows in addition to cross, to perform tricks like jumps in the city, hurtling down the stairs, jumping benches and street furniture, etc..
Basketball Unicycle: is often a wheel with 20 or 24 "with smooth tire to go in the gyms. What Unicycle type choose for my child ? We advise you to let your child choose the discipline as it deems fit with time, and to prioritize a beginner unicycle standard for your first purchase. Again, these are only aids to choose the best discipline. What unicycle to pick a 3 year old starting ? A 12" unicycle size is suitable for a child this age. This is the standard size of unicycle with which he has to train. It can then opt for a 16" then if it grows fast. What unicycle to pick a 6 year old starting ? A unicycle 16 "size is suitable for a child this age. This is the standard size of unicycle with which he has to train. It can then opt for a 18" then if it grows fast. What unicycle to pick a child of 8 starting ? A unicycle 18" size is suitable for a child this age. This is the standard size of unicycle with which he has to train. 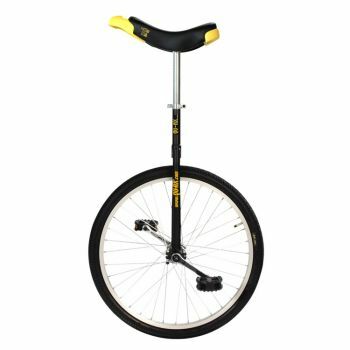 It can then opt for a 20" unicycle thereafter, and choose your favorite category. (Trial, Street, Freestyle, Racing, Basketball, etc.). What unicycle to pick a child 10 years starting ? A unicycle 20 "size is suitable for a child this age. This is the standard size of unicycle with which he has to train. The choice of the unicycle must be based practice. To drive down the street or on the floor of the garden a beginner or artistic unicycle is suitable. For jumps and descent of stairs rather prefer a unicycle type with a large tire Trial. What unicycle to pick for an adult male ? 24 inches (60 cm): This is the size for walks or to ride faster. It is equivalent to a speed runner. It can also be used for the figures for large gabaris. A beginner can start with a 24 inch as well. 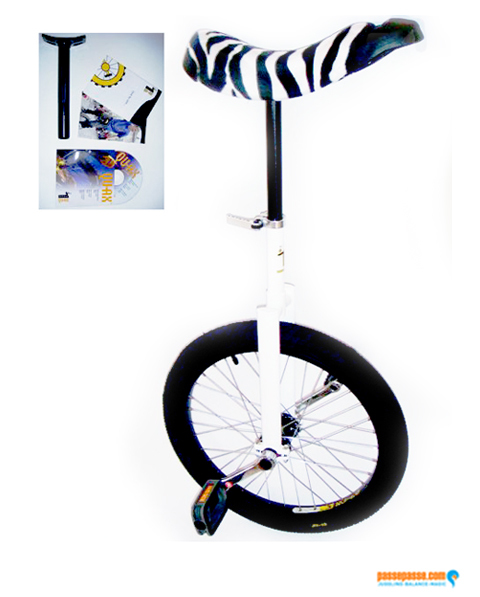 26/29 inch : This is a unicycle for ballads, it allows you to move the same speed as a bike city. It is ideal in terms of wheel size for those who want to ride. It is less tiring, there is a higher cruising speed. 36 inches : This is the unicycle for long journeys. Want to make 100 km unicycle or more? This unicycle is for you! How to choose my learners unicycle ? There are different types of unicycles for beginner. Some are more solid and strong, others less, but cheaper. It's to you to see how you want to use it, and if you are sure to want to continue unicycle after it. If you do not know yet what discipline to guide you, prefer a versatile unicycle. 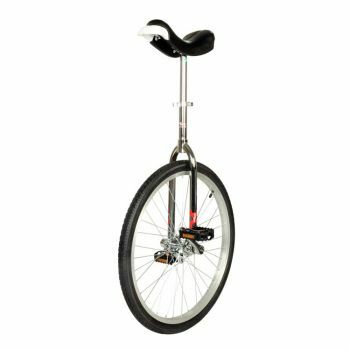 Most first prizes unicycles are often with poor quality pedals, and are clearly not designed to do jumps and go in stairs and steps. For cheaper unicycle: We advise you to choose type of unicycles Only-One. However, it remains unicycles entry level. For more solid unicycle : You should choose unicycle type Qu-Ax or Udc which are more resistant to shocks and perfect for schools and clubs. How to choose my freestyle unicycle ? There are different types of unicycles Freestyle according to the figures you want to achieve. To you use to target you wish to have. If you want to practice a freestyle at the American / French: Prefer smooth wide and white tires as a 2.10 The Wall tire, and pedals Miyata freestyle classic white. Cranks 90, 100, and 110mm seems ideal for this kind of practice for all types of figures. If you want to practice a freestyle to the Japanese: Prefer smooth white tires type of 1.75 like Panaracer or KHE and cranks of 70mm. How to choose my Trial unicycle ? Prefer a Round fork for added strength, a solid axis, and a wide tire with studs. Long cranks as the 140 or 160mm will allow you greater stability during jumps. Pedal pin are ideal to avoid slipping on the pedals in the rain, but also allow you to make crisp, sharp jumps. Finally a unicycle light to get easier. How to choose my Flat Unicycle ? There are different types of unicycles Flat according to the figures you want to achieve. To you use to target you wish to have. For the Flat more oriented Freestyle : Focusing unicycle with a smooth tire and cranks just like the 125mm shorter, more flat to a "cast". Add more later if need rollos disc to expand your cranks and be more stable. How to choose my Cross, Off-Road unicycle ? There are different types of unicycles off-road, Cross, Muni (Montain Unicycling) depending on the speed and type of terrain you ride. You must first target the use you wish to have with this unicycle. To practice unicycle off-road on very steep slopes : Focusing unicycle off-road tire with a big, long cranks 140mm or 160mm as of, and a wheel size 24 " / 26 ". A larger wheel size might hinder you to scale the heights. 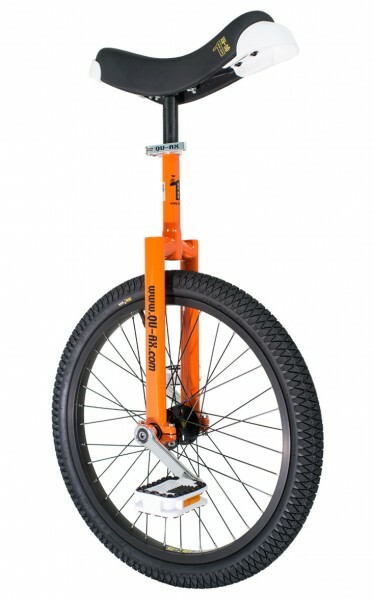 To practice unicycle off-road on land less steep : Focusing unicycle with a large tire and cranks shorter sentence as the 125mm, and a wheel size 26 "/ 28 "fitted to the" smoother ", and scroll more quickly through long distances. How to choose my Road/Hiking unicycle ? There are different types of unicycles and Hiking Route according to FIGS you want to achieve. A target you want to use. To get to work downtown or move easily : Focusing Road unicycle 26 "or 29" with an all-terrain tire or smooth (as needed) and 140mm cranks. It gives you a good wheel size while keeping a minimum of handling. For long trips, hiking, or marathon : To focus on monocycle 36. "It allows you to easily swallow km. Also it is often equipped with handlebars and a during heavy braking downhill (handle with care!). Ideal for backpackers who want to link Paris to Marseille in a week. Choose shorter cranks if you want to gain speed (Note: Below 125mm cranks, risks increased markedly!). It is essential to wear a helmet and protection every time you ride! How to choose my Race unicycle ? Race unicycle 1000m/3000m : Focusing unicycle 26 "/ 28" stroke with a rim and a tire late to have a good air penetration, and a good aero dynamics. How to choose my Unicycle saddle ? There are different type of stool following uses and disciplines. Freestyle, Flat Street, Trial: We recommend choosing stool thinner and lighter. You will be able to perform tricks much easier. Be careful though, they are often less comfortable. If you want further strengthen your saddle then you can put a carbon base for added rigidity and strength. Contact us for more information. Road unicycle: Opt for thicker and padded stool or air. You can also opt for stool airy center like some models of Kris Holm. Some models or Kris Holm Impact offers lace covers inter-changeable that can be nice. Here, for you to see which suits you best :). How to choose my Unicycle seat post clamp ? There are different type of clamp unicycle. Should be chosen according to its use. For beginners : We recommend choosing a quick to unicycle. This is the best way to be able to easily change saddle height without the need to always have an allen key with you. For your specific discipline : Prefer a fixed attachment to unicycle. There are bolts with 1 and 2, depending on the level of strength that you want to have. A seat clamp bolt to a may be sufficient, however for extreme discipline, you should opt for a tie with two bolts . How to choose my Unicycle fork ? There are different types of forks following uses and disciplines. For Street, and Trial:We recommend choosing fork-type "shortneck" with a neck smaller in order to lower the saddle easier, because a low seat height will be adjusted and Trial Street. Also prefer round forks for trials, forks and solid squares for the Street. For Freestyle and Flat:We recommend choosing fork-type "longneck" with a long neck so you can not be hampered in your movements and manipulation, and not to hurt you . Also prefer fork square to easily make figures thereafter. How to choose my Unicycle axle ? Square Axis: The square shaft is the most classic is suitable for use "normal" unicycle. He asks to have the cranks corresponding square. Isis Axis : The axis Isis was created to meet the demands of riders. The star-shaped axis has a higher reactivity, and reinforces the strength of the . He asks to have the corresponding cranks isis. You choose the type of axis that suits you best. How to choose my Unicycle tire ? There are different types of tires following uses and disciplines. For Street, and Trial: We advise you to choose tires with type relief "cross" in order to have a better adhesion barriers, and receptions do jumps and sharper. For Flat : We recommend choosing tires mid-smooth mid-hard, so you can push easly the wheel. (Choose a large Trial tire for flat). How to choose my Unicycle cranks ? There are different types of cranks following uses and disciplines. For Street and Flat: We recommend you crank through 125 to 140mm in order to have a good handle on receptions and a good command in the figures. For the flat you can also add "rollos disc" to expand your cranks. Trial, Off-Road and Muni: We advise cranks from 140 to 160mm long for better stability on site and better control in the very muddy roads. It will be much stronger and can withstand shock, and accoups. Freestyle: We recommend the 90 to 125mm cranks because they allow to go slightly faster and the figures are adapatés Freestyle as the spin or walk on the wheel. For Racing: Prefer shorter cranks like 75mm or 90mm depend on your wheel size (take longer cranks for the wheel of 24/26/28/36"). More your crank is short more you can go faster. But it will also take more time to start and stop. So becarefull to the speed danger ! For Road and Trail: Prefer cranks from 140 to 160mm long. With it you will have a good control on descents and not risk it difficult to stop your unicycle. How to Choose my Unicycle pedals ? There are different types of pedals following uses and disciplines. For Trial and the Street: We recommend the metal pedals, because it is much stronger and can withstand shock, slides, accoup, etc..
For Freestyle: We recommend plastic pedals without pins because they are often practiced indoors, and metal pedals can damage the floor. For the Flat and Street: The plastic pedals with cleats Odyssey type may also be suitable. To avoid damaging the floor but not to slip on the pedals when used outdoors on rainy days. For off-road and Muni practice: Prefer metal pedals with pins. With it you will not even get out of hand in the very muddy roads. How to Choose Unicycle tools ? A 15mm wrench : To screw up / unicycle pedals. A crank extractor : To remove the cranks of your unicycle. An 8mm Allen key : To screw / unscrew the clamp bolts and change the clamping height of the saddle. A pump : To re-inflate your tire. A spoke wrench : To tighten your spokes that when you déserrent skip. You can also bring patch and tube in case of puncture. How to Choose Unicycle protection ? Knee protectors : To your knees from falls. Shin guard : To protect your shin returns of pedals, and bad receptions figures (UNISPIN, crank-flip, etc..). Helmet : To protect your head from falls. Protects wrist: To protect the wrists Falls beginners. Gloves / mittens : To protect your hands from falls, or some figures (such as walking on the wheel with your hands). back protectors can also be used for figures of great peril (such as front somersault), or trials riders and children. How to Choose Unicycle Books ? It may be helpful to have books to progress on unicycle. Although usually unicyclists look more videos, the book give you tips and tricks and help you to learn some tricks but also to better know your unicycle. All these tips are given by unicycle champions and you can progress very rapidly. You choose a book based on your discipline. If you have a good level and you wish to make a book you can also contact us at contact@funicycle.com . How to Choose Unicycle Dvds ? There are a lot of Dvds unicycle that can help you learn the unicycle, and progress. If you have a good level and you want to make videos or join us in our designs please contact us at contact@funicycle.com . In how much time will I receive my unicycle ? We do our best to respond to all orders in the shortest time. 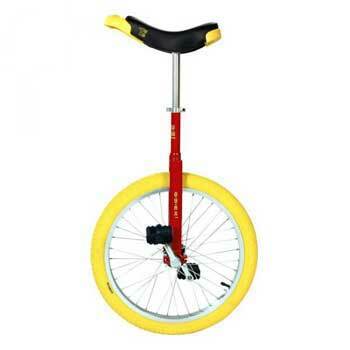 So if your order has been correctly registered and paid, you should receive your unicycle within three weeks. However for some specific items from far away as Japan, it is possible that the time is slightly longer. We appreciate your understanding. What are the different shipping rates ? However, these rates may vary depending on the times and rates of delivery companies (eg the Post Office, UPS, etc..). We make no profit on shipping costs, and we do not guarantee any increase / decrease in prices at this level. Also the price of the item may change at the last minute (especially for long-haul shipments). How to mount your unicycle ? 1) Take the wheel and fix the frame on the bearing. 2) Put the slit of the frame in front of you, and fix the right cranks on the right side and the left on the left side (R or L inscription should be on the back of the cranks). 3) Then put the pedals accordingly. 4) Then put the saddle inside the frame. The slit of the frame should be in back, and the handle of the saddle in front. That's it. You build your unicycle. Enjoy riding ! - Take care to don't tighten to much the bolt of the frame on the bearing ! The wheel should be able to go smoothly. How old does one have to the unicycle ? You can learn at any age ! Here everything depends on your character. The age of those who learn the unicycle from 18 months to 70 years. This is a fun sport for all ages to practice alone or with family. How to Learn the unicycle ? 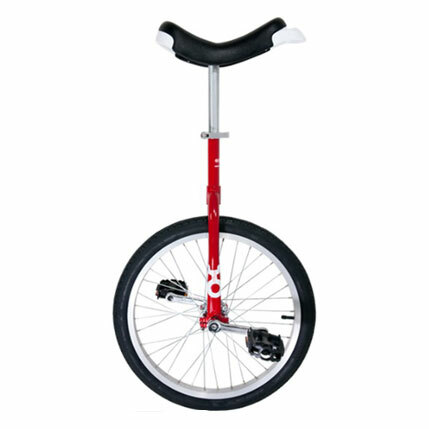 To learn how to ride a unicycle, you must adjust the saddle height, is set against a wall, climb up, and try to pedal. The beginning may be a bit difficult, but finally one day we loose the wall ! And go for happiness ! After you have to be patient, you say it's like when you heard the bike, it took some time, but after you were happy! To learn how to ride a unicycle and learn more advanced figures we recommend the association Monobussy in Paris. How long does it take to learn unicycle ? Again, it depends on your character! Some people can climb in a gym without assistance after 3 hours. Most roll after a week of daily practice, others several months. This variation is often related to your concentration, in training, perseverance, understanding, and listening to others. But the best is yet to try ! Should I wear safety ? Of course! Protections are still recommended even when there is even a remote possibility of injury. Whether the helmet, shin pads and knee pads, wrist protectors, elbow pads and gloves, they are all very important. Especially in the beginning, it is not in a abbri back pedal in the shins. However, the use protections belong to each individual. Some subjects such as street and require special trial to be well equipped. And certain events of unicycle, and competition as the national championships or Unicons, require these facilities to participate. What Unicycle tricks can I learn ? That's it ! Have a good trainning ! Are there lessons to learn the unicycle ? Yes of course! You can now get closer to the various clubs unicycle that can be in your area, and also attend meetings of unicycle to meet us. We also recommend the association Monobussy if you are close to Paris to learn the unicycle. Then you can take classes with World Champions unicycle and become stronger very quickly. How to learn new tricks Where can I watch ? First look on the internet and youtube you will find lots of videos. You can also watch our blog on sites unicycle, or on the website of monobussy . You can also watch books and dvds that we sell. They surely will help you to progress! What are the differents unicycle disciplines ? - The Freestyle: The freestyle oriented all the figures on the ground that one can do on a unicycle. In competition, the competitor has 3 or 4 minutes to perform a choreography / a show with music and costumes of their choice. This is the oldest discipline of the unicycle. - The Flat: Discipline recent born in France around 2008, it includes all the figures which are practiced near and around the unicycle: bearing crank by pushing on the tire, around the world, etc..
- The Street: Discipline created by Dan Heaton in the United States, it includes the figures of the street: crank flip (jump with rotations cranks), slide, downhill steps forward, backward, tiregrab, superman, UNISPIN (rotation of the unicycle), etc..
- The Trial: The trial is up, down, or jump over obstacles with a height, or a large spacing. - The Off-road (Muni): Practice of mountain unicycling, or hiking trail. - The Athletics: The Athletics unicycle includes all events: 50m, 100m, 400m, 3km, 10km, 40km, etc.. But also, a 50m walk, 50m walk on the wheel, high jump, long jump, gliding, coasting, etc..
- The Basketball: The basketball is also practiced on a unicycle! And yes! Like hockey elsewhere. The rules are pretty much the same as for the classic basketball, but with a unicycle fun is much bigger! Where come from the unicycle ? The unicycle comes from circus, but it grows more and more because it brings many advantages: ease of travel, developing balance, perseverance, handling, compactness, speed, etc.. But it was not until the 20th century it came back up to date, with many people around the world including John Foss (Organizer of the World Championships). Its development has increased dramatically and so many people have started taking a closer look and to practice more intensely ! Do you know where to find Secondhand unicycles ? We found that when people learn the unicycle, they hardly ever sell their unicycles. But you can look in our secondhand unicycle section there could be some unicycles for you. You could also always try to find some on the internet. We also serve some of intermiaire if you want to dispose of one of your unicycles, do not hesitate to contact us, we will spend an announcement on the site. What is a giraffe unicycle ? Who and why was create Funicycle ? 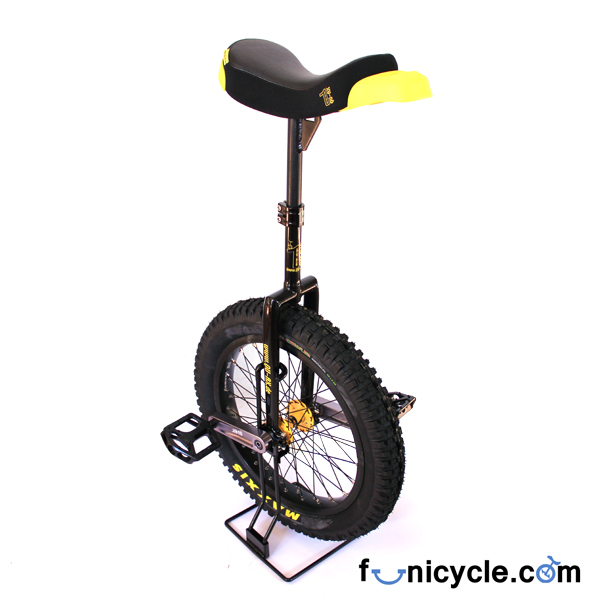 Funicycle unicycle is a store established in March 2012 by Pierre-Yves Billette passionate unicyclist. He was unicycle World Champion in freestyle in New Zealand in 2010 and several times champion of France. He created this store specializes in selling unicycle to offer a wide range of unicycling as many people without distinction. What's better than World Champion unicycle to advise you on your hardware!? !